Unlike most houses in modern cities which are nothing but jungles of concrete with nothing but unending rows of apartments and other commercial establishments, my house was located a good distance away from the hustle and bustle of the city and very close to the woods. Being an only child and not having any neighbours, I led quite a recluse existence and liked to wander in the woods, explore the sights, sounds and smells of nature. When I got bored, I invented games and imaginary friends to keep myself occupied. One fine afternoon on a lazy weekend, I was dawdling in the woods, when I heard strange whirring noises emanating from the sky. Glancing up, I could see a bright light and a saucer-shaped object which was about to land. Intrigued, I stepped forward in trepidation to observe this all too strange phenomenon right out of any standard sci-fi novel or movie unfold right in the front of my eyes. A weird looking metallic man stepped out of the UFO and spoke in deep guttural tone – “KGGGYYPPT ZYRRROPT”. He walked towards and handed me a device which looked like an iPod with way too many buttons. On pressing one of them, suddenly his gibberish began to make sense. “My name is KT-5402, I come from the Planet Toron 70 million light years from Earth with an objective to study about the human race. I have a choice to adopt one of the following human forms during my stay on this planet. Will you help me choose”? He handed me three photographs. “This one, the others are too old”. He immediately transformed into a 15-year-old boy, the same age as mine as I gaped in wonder. I christened him Keshav (indeed a catchier name than KT-5402) and took him for a tour of the woods. He observed everything with curiosity and the innocence of a 3-year-old and whipped out his IPodesque device at the slightest opportunity and pressed another button which gave him information about his surroundings. I took Keshav home and introduced him to my parents. He seemed impressed by my home and joined us for supper later that night (since he was in human form, he could eat our food). After supper, I took Keshav to my room and made an exploration plan to the neighbourhood city. The next morning, I took him to a mall, and we watched a movie together. The youngsters were bubbling with excitement as some of the biggest names in WWE; Brock Lesner and ‘The Rock’, Dwyane Johnson were descending to town next week. I whooped with joy and told Keshav that he was in for an experience of a lifetime. Over the next week, I took him to some other touristy spots like waterfalls, hill stations and temples. We were drawing close to the game day, and everything was in place. Keshav and I left early on the big day and made it to the arena with plenty of time to spare. It was jam-packed, and the fans were screaming themselves hoarse. It was one hell of a fight, both Brock and the Rock pandered to the fans there. We had a whale of a time and went back home thoroughly entertained. As we reached home, KT-5402 sprung a surprise on me by saying that he wanted to take me back to his home planet Toron. I was startled beyond belief and could only stammer –“But… But. But. Isn’t Toron 70 million light years away, that journey will take forever, I would be dead long before that. KT-5402 assuaged my worries – “Don’t Worry, a journey of 70 million light years will take the equivalent of 70 Earth Days –“A trip of the Observable Universe in 70 days”, he chuckled. My ship is well stocked, so supplies will not be a problem. We will be travelling through Worm Holes and have a few stops along the way. My mind whirred at the mention of wormholes and I suddenly wondered how happy the Late Stephen Hawking would feel if he could hear our conversation. “We have to go now”- KT-5402’s voice brought me out of my reverie. I sneaked out of the house and followed him to the spaceship. I was awestruck at the swanky interiors which could beat any 5-star hotel. ”Make yourself comfortable”, my host said, It's going to be a long ride. “Welcome to the Toron Infinitum “, an automated voice on the ship spoke. I strapped myself in as the spaceship took off. Within moments, we had left the earth’s stratosphere. “Your first stop will be the moon”, the voice aboard the ship said”. KT-5402 seemed at ease and tried to make me feel relaxed. We reached the moon at the end of day one of our long sojourns. We had a couple of hours to explore the moon, and I was bursting with excitement. It had always been on my bucket list to walk on the moon and follow the footsteps of Armstrong and Aldrin, and it was just about to happen. The moon is rocky, lifeless and eerily silent. The lack of gravity takes time getting used to, but after a while, I enjoyed bouncing around on the moon, the 2 hours went by in a jiffy, and we were back on the spaceship again, hurtling through the hitherto unknown and unexplored realms of space. I told KT-5402 that we were like Han Solo and Chewbacca. I wanted to explore a few other planets in the Solar System but was told that we did not have the time if we wanted our journey to stay on track. Nevertheless, I had quite a close look at Jupiter’s Red Spot and Saturn’s unmissable rings and asked KT-5402 to capture high-resolution images of the same. He directed the voice command system on the ship and then instructed it to take further pictures of anything else that I might ask during the trip. Our next stop was the Andromeda II galaxy a couple of days into the trip. I was starting to feel a little disappointed as I expected to be overwhelmed by incredible sights throughout the journey but it was mostly dark and empty nothingness, and I realised it was called 'Space' for a reason. I was told that Andromeda II is a dwarf spheroidal galaxy about 2.22 Million years away in the constellation Andromeda. We landed on an exoplanet named the XN 7000 and the conditions there closely resembled those on Mars. We again only had a couple of hours to explore the twin of the Red Planet, I took some rock samples back to ship to satiate my curiosity, and we were on our way again. NGC 300, NGC 55, Kkh98, Dwingeloo and many more, I lost track of all the galaxies we had crossed in the course of our trip and all of a sudden, I realised that the 70 days were almost over and we were coming ever closer to Toron. “My home planet beckons,” said KT-5402 excitedly. Toron is a planet whose core consists primarily of iron. It is one of the sixteen planets in its solar system. It is ten times bigger than Earth, and its gravity is about 3.2 times that of our home planet. A single day here lasts for about 25 hours and a year is 280 Earth days. Toron has three moons and orbits its sun in a perfectly circular orbit. The plant-like organisms on this planet are almost exclusively several types of grass. A few of them reach incredible heights while others would barely be noticeable on the floor if not for their striking fluorescent colours. The corals underwater are more spectacular than the organisms on the surface. Much like trees on the Earth grow leafed branches, the corals on this planet grow to humongous sizes and have branches with modified polyps. The planet is home to many sentient mammals as well. KT-5402 gave me some time to absorb all the new information that was bombarding my senses and later introduced me to other members of the clan; XS-6000 the head, his wife PR-7200, his brothers MO-9001 and DF-5680 and his children RT-4200 and MP-8100. I observed the settlements on Toron, and they had an uncanny resemblance to igloos on the outside and were extraordinarily hi-tech and well equipped on the inside. I met a few other clans, KT-5402 had spread the story of his warm reception on planet Earth far and wide, and the inhabitants of Toron seemed eager to reciprocate. One of the clans invited me home and offered me a liquid that resembled raspberry juice, I drank it cautiously and to my surprise found it rather pleasant. My days were spent narrating tales of Earth to the highly inquisitive but incredibly polite people of Toron and also examining the societal structure there. They were highly organised society built on the principles of equality and dignity of labour. Time and again, when there was a choice between what is right and what is easy, their forefathers chose the right path, and this is how their race endured for millennia. "Let's go to Valley of Flowers." "We have a long weekend in August, and I'm up for another trek. ", she asserted. I wondered why it has to be the valley of flowers. I have done high altitude treks, and this one was never on my bucket list. I was eyeing either Rupin Pass or Kashmir Great Lakes to be my next destination. However, I had to concede seeing that everyone agreed and we went ahead with the valley of flowers. No matter how well you plan your commute in Bengaluru to avoid traffic, it always gets to you. It took me 2 hours 45 minutes to reach the airport, and I could have missed my flight to Delhi, but luckily I didn't. IGI airport, T2 arrival was our rendezvous point, and we waited for everyone to join. The clock struck midnight, and we had a little surprise birthday celebration on the road before boarding the cab to Haridwar. The drive to Haridwar was short and comfortable, and there we met the larger group at the railway station. A quick introduction and we were all set for another journey to our first base camp, Govind Ghat. I hate travelling on the hilly roads but can't escape it for all these destinations I keep planning. It was an excruciating 11 hours of spin, and we reached base camp in the late evening. 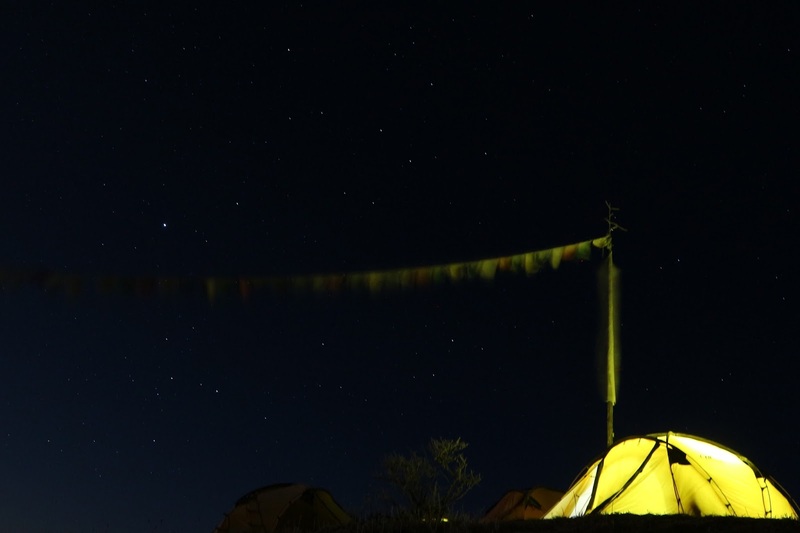 It was almost dinner time and soon after that everyone gathered including trek leader, support staffs and all of us. 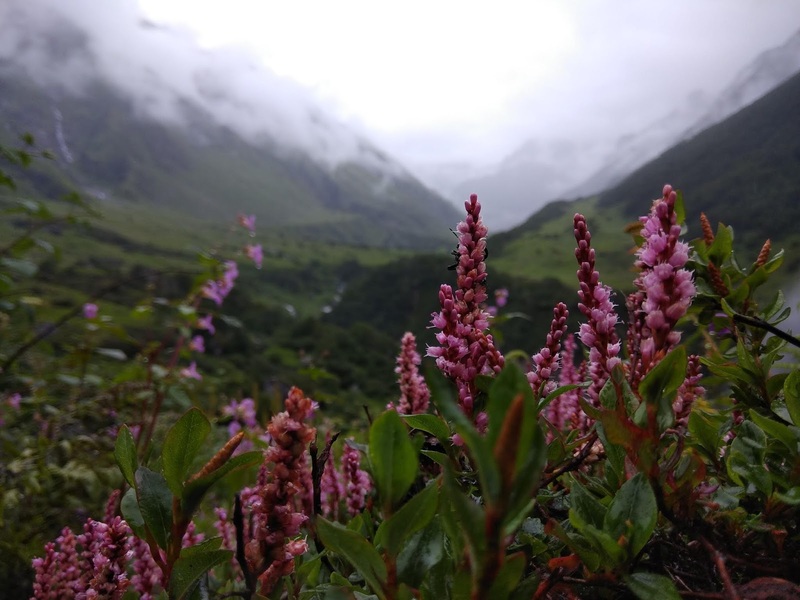 I realised it was the first-time high altitude trek for most of them, and I again contemplated why I chose 'Valley of Flowers'. "Would it be worth it? ", I thought to myself. A bit disappointed I discreetly strolled the street from one end to another. The next morning, after a quick breakfast, we were all geared up to begin our adventure. It was a 4 km bumpy ride till Poolna, and from there it was 9 km trek to Ghangharia. The trail was well defined, and it goes parallel with a river. 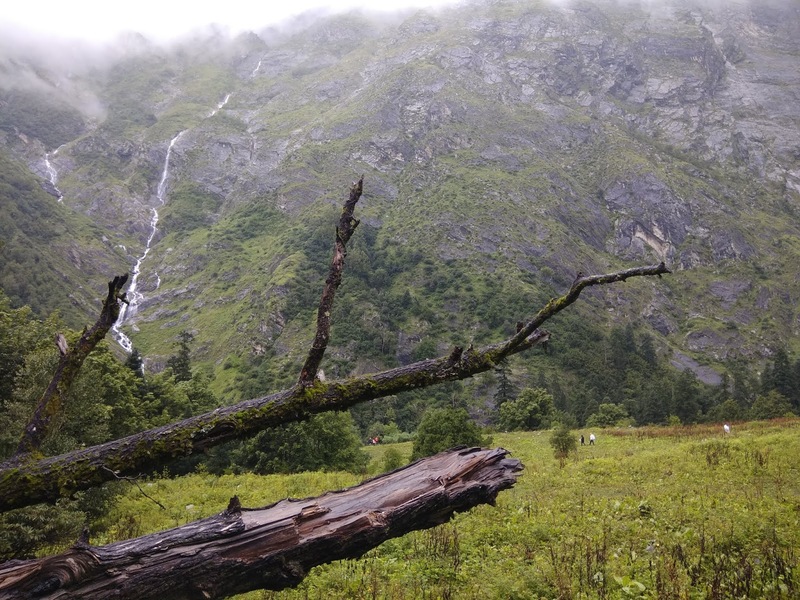 It was a delight to walk next to the rushing river amidst lush green cover and rain pouring over my head. The trail has umpteen number of dhabas along the way, and we stopped at one to savour Himalayan Maggi. I know it is the same Maggi by Nestle, but it tastes so distinctively delicious at high altitudes. The journey continued, and we reached an open space just before entering Ghangharia. A mountain with clouds nestled over its peak, a cascade of white water falling from a height on the far side, and the green meadow offered a feast to the eye. I was soaked in the beauty as I kept looking back while moving towards the hamlet. It was a long tiring day, and I had plans to explore the place, but the body said, "Not Today". "It is raining outside", announced my roommate in the morning. "We might have to change today's plan if the weather stays like this", said our trek leader during breakfast. It seemed it wasn't a good start to the day, however, things turned out well in the next half an hour, and we were on to the valley of flowers. It was a short trek of approx. 4 km but we had to return to Ghangharia same day as campings are not allowed inside the valley of flowers. It didn't take long, and we saw a carpet of colours spread across the place. It was nice to have Yashpal bhai, the flower expert, with us who kept telling the local names of the flowers and I tried to take mental note of it, but very soon I gave up. As we reached halfway, we made a quick stop beneath a huge rock and waited for others to catch up. It had started raining again, but we continued going further inside the valley crossing one stream after other. It wasn't now just the flowers, but also the waterfalls. One waterfall, next to another waterfall, next to another waterfall, and I saw it in all directions. It appeared to be like a scene from planet Pandora in the movie Avatar. I stopped at the memorial of Miss Joan Margaret Legge. She was a botanist from England who died here while collecting flower samples. Her sister built the tomb, and it had a beautiful quote inscribed on it. Not a very popular trekking destination but I thought to go for it. I had done a couple of treks before in the Uttarakhand region, and this seemed a bit different. Sandakphu is the highest peak in West Bengal, and it offers a grand view of the world's tallest peak - Everest (8,848 m), Kanchenjunga (8,586 m), Lhotse (8,516 m) and Makalu (8,463 m). Moreover, it gives an opportunity to cross the border and continue trekking in Nepal for half the duration making it an international trek (Haha!). I had enough reasons to finalise it as my first excursion in the Year 2018. 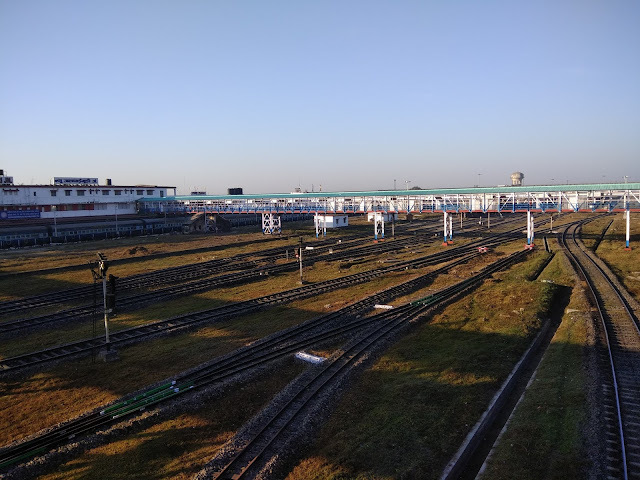 I began my journey on 30th December 2017. I reached New Jalpaiguri next morning from where my pick up was scheduled for Jaubhari - the base camp. I joined other trekkers, and we were briefed about high altitude treks, the village, and Project Green Trails. I had a good night sleep and was mentally prepared for the challenges from next morning. We started early morning, and our destination was Tumling. The distance we had to traverse was 11 km with an altitude gain from 6,400 to 9,450 ft. Our first halt was Chittrey where we stopped for a quick tea break and roamed around a monastery. The journey continued, and I encountered India-Nepal border stone - a good photo opportunity and I took some time to click pictures. We continued to Lamaydhura where we stopped to catch up with the group while enjoying Tibetan delicacy from a local shop. The trail from Lamaydhura continued to Meghma, and on the way, we crossed SSB check post. Not very far from here, we stopped for lunch in one of the tea house. It took us another 45 minutes of flat walk (right next to the motorable road) to reach Tumling. It marked the end of our day's trek, and we were greeted to the views of the Sleeping Buddha. The Sleeping Buddha (also called 'Sleeping Shiva') is the name given to the Kanchenjunga cluster for its appearance. Mt. Kumbhakarna forms the head and face of Buddha, while Kanchenjunga forms the upper body. The other peaks that make up The Sleeping Buddha are Kokthang, Rathong, Frey, Kabru South, Kabru North, Simvo, Mt. Pandim, Tenzingkhang, Japanu, Narsing. The day began with an exhilarating view of Mt. 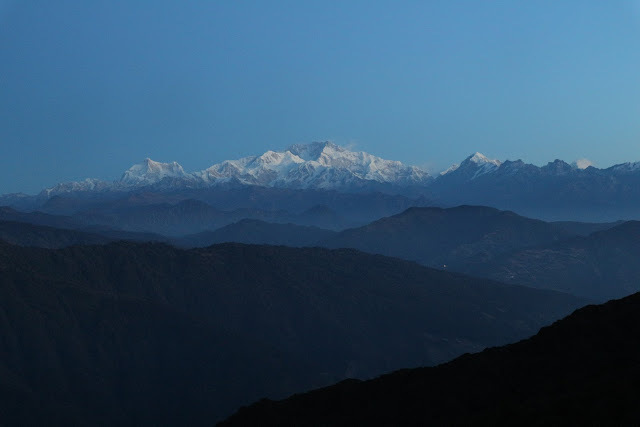 Kanchenjunga bathing with first rays of the sun. Such a glimpse pumped us for our today's trek that was supposed to be challenging. Our destination was Kalipokhri, and the distance we had to traverse was 13 km with an altitude gain from 9,450 to 10,400 ft. We discarded the motor road and followed the hiking trail. It took us to Gairibas where we halted to catch our breath. Gairibas is a small village and marks the beginning of Singalia National Park. Our next stop, Kaiyakatta, was not very far but the trail included a steep climb. We had our lunch here! The difficult part of the trek was over, and we slowly moved to Kalipokhri. It is said that the Kalipokhri (black lake) is the footprint of Lord Shiva. The darkness soon engulfed the place as we reached our homestay. The next day's trek was not long and only slightly steep. 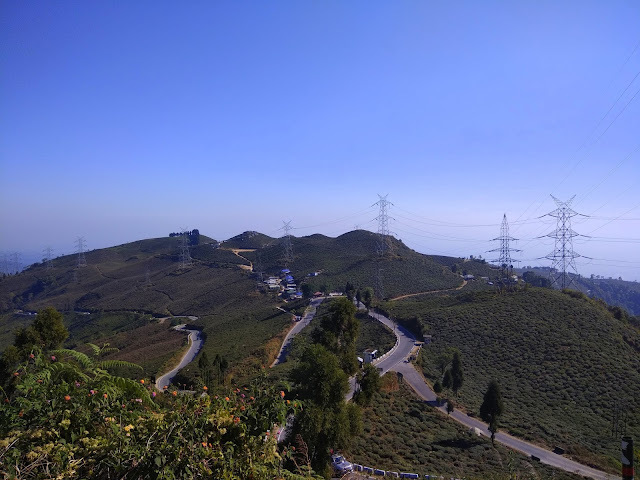 Our destination was Sandakphu, and the distance we had to traverse was 6-7 km but with an altitude gain from 10,400 to 11,950 ft. As we reached here, we spotted a glass house near the cliff, and it gave 180-degrees panoramic views of the Himalayan peaks. While some of us sipped tea and coffee inside the glass house, I just walked around contemplating yet another Himalayan summit. We all are constantly looking out for something that could keep us as healthy as possible. But what if one comes across something that could not just benefit a particular organ or disease but has multiple benefits and can literally give people branding other vitamins a run for their money. Vitamin E is one such nutrition that has multiple benefits. It plays many roles and not just takes care of health but naturally slows aging. Now, isn’t that great? I have been trying my best to keep the most appropriate amount of vitamin E in my diet as I heard a lot about the good it does and not just to one’s body but also skin and hair! Mostly, vitamins and other nutrients tend to only add to the goodness but vitamin E also protects the cells from damaging. Vitamin E also plays the role of antioxidant, preventing free radical damage to specific fats in the body. Vitamin E is also known as fat- soluble vitamin that’s required for the proper function of many organs. Further, vitamin E-rich foods also helps in treating and preventing diseases of the heart and blood and is found only in plant foods, including certain oils, nuts, grains, fruits and wheat germ. So, I recently increased vitamin E intake and that included taking more almonds and avocados. Almonds lower blood sugar levels, reduce blood pressure, lower cholesterol levels, reduce hunger and promote weight loss. On the other hand, avocados are nutrient-dense fruit. Further, I also started using olive oil not just as my cooking oil but also for my skin and hair where I use it with carrier oil. This makes skin and hair texture better. Vitamin E s also known for making vision better and one of the good sources for that is palm oil. And it also boosts immunity and prevents cancer. Palm oil is mainly used as cooking oil. It’s not just oils and fruits but we also have healthy snacks to munch on and also get the best out of it. Sunflower seeds are one such snack that has plenty of vitamins E. It is known to reduce risk for heart disease. So, you can always grab a nutty bar covered with sunflower seeds and have it to improve your energy level on the go. And how can I forget to mention spinach that I have increased intake of. The best part about this particular food is that you can eat spinach raw or toss it up in salads and consume all the goodness. For the people who love to munch on non-vegetarian delicacies, shrimp is one good source of vitamin E. Shrimp may be high in cholesterol but it is a low- calorie food which is rich in minerals and vitamins, especially Vitamin E. To get the maximum vitamin E intake one can combine shrimp with chopped onions, tomatoes, chilli peppers, garlic, lemon juice, and put olive oil on a bed of romaine lettuce. Vitamin E intake can always be fun and easy for kids and adults to consume and take care of themselves from many diseases and it’s not only only about the cure but vitamin E also prevents! With the right amount of Vitamin E intake in the diet and doctor-recommended Evion supplements - India's No.1 Vitamin E Brand, one can live a healthy and well-balanced lifestyle. Go #Evion to win over Vitamin E deficiency.